Older people increasingly worried about health care | Lewis & Ellis Inc. Millions of baby boomers have either surpassed the age at which they begin to qualify for Medicare benefits, or are rapidly approaching that point. Thousands of people nationwide turn 65 each day, and that's a trend that will continue for many years to come. It's no surprise, then, that with rising health care costs and the prospect of moving to a fixed income within the next several years comes looming concern about how today's older Americans are going to be able to stay healthy in their golden years. In fact, those worries are already coming home to roost for many of them, according to a new poll from the University of Michigan. More than 1 in 4 people between the ages of 50 and 64 who currently have health insurance say they're not sure how they're going to be able to afford paying their premiums this year, and nearly half have little to no confidence about their ability to cover health care costs when they finally retire. Older Americans may have more to consider when it comes to health care costs. To that end, 10 percent of respondents in this age group said they considered going without health insurance at all in 2019, and half of those people actually ended up doing so, the survey found. Moreover, nearly 1 in 5 older people polled said the only reason they stayed in their current jobs - rather than switching to a new company or simply retiring - was to keep the coverage their employer sponsors. "15% said they have postponed medical procedures." Among those who did change their coverage situations for the new year, 15 percent already said they have been postponing past medical procedures to make sure they can afford it on their newer plans, the report said. Moreover, 8 percent of respondents between 60 and 64 said they're going to wait until they're eligible for Medicare to get some necessary procedures done. Problematically, 20 percent of all respondents said they have little or no confidence that they could understand even basic insurance terms. Furthermore, the poll - which surveyed more than 1,000 baby boomers under the age of 65 - found that more than two-thirds were concerned with how their health insurance situations may change with a seemingly fickle federal policy, and about half follow the news about these topics - from the Patient Protection and Affordable Care Act to Medicare and Medicaid - as closely as possible. The ACA in particular might be important for people in this age group, as the researchers behind the poll also found that the uninsured rate for 50-to-64-year-olds dropped by nearly half since the law was first put into place. "As people age into the years when many chronic diseases begin to take hold, and when they're still years away from Medicare coverage, it's important to talk with someone knowledgeable about all the options for coverage to bring down out-of-pocket costs and better navigate health care in this critical period," said Dr. Renuka Tipirneni, M.D., University of Michigan health researcher who helped design and analyze the poll. Nationwide, millions of people have health insurance that is not funded by an employer or a government program, but rather buy it themselves from the state or federal insurance exchanges - or simply go without. Often, those who go through the online individual marketplaces have their coverage costs subsidized by the federal government to make it actually affordable, based on where they live and their own financial situations. However, according to Kaiser Health News, about 5 million people on the exchanges last year - making up about 1 in 8 of everyone buying their coverage through these channels - did not qualify for such subsidies, and often that applies to older people. "1 in 20 say they do not plan to have health insurance this year." The fact that only about 1 in 20 people between 50 and 64 say they do not plan to have health insurance this year highlights the broad understanding among this group that they need some help to cover their mounting medical expenses, but the lack of subsidies is still a major issue for many, the report said. "At my age, I can't go without it even though I'm healthy now," Diane McCabe, 62, a self-employed real estate agent in Pennsylvania, told Kaiser. "But the process is frustrating, and the expense significant." Indeed, McCabe says she pays for an entire $773 monthly policy out of her own pocket, and that's on top of a $4,000 deductible, the report said. That amounts to about 15 percent of her projected income for the year. And with insurance premiums only likely to keep rising for some time to come, people like McCabe, who are approaching retirement age and potentially the winding down of their earning power, are increasingly feeling the squeeze. Experts note that while many people approaching their retirement ages are right to be concerned about their current and longer-term health care costs, there are things they can personally do about it, according to GrayBeard Retirement, writing on Seeking Alpha. Chief among them is cutting out unhealthy lifestyle choices they have made in the past that they've stuck with. For instance, using tobacco products of any kind is usually a way to ensure health care costs - including insurance - remain high; data suggests that people may be able to live as much as five years longer and save about $2,000 a year on health expenditures if they stop smoking. The same is true of trying to eat better, the report said. Older adults who don't eat well are quite susceptible to Type 2 diabetes, and having it can make their health care costs explode. Even if Type 2 diabetes is well-managed, it can add more than $5,000 a year to those expenditures; managing it poorly brings on an additional $7,000 in costs. This goes without mentioning the other health risks like general obesity and heart disease that come with a poor diet while aging. Some of that risk can be curtailed by more exercise as well, but people should certainly talk to their doctors about establishing a solid plan for keeping costs down and health good as they age toward their retirement years. Alternatively, some consumers may also consider the benefits of enrolling in short-term "association" health plans that will allow them to keep their premium costs down in exchange for "skinny" benefits, Kaiser Health News also reported. For older people with certain health issues, these may not be ideal because association plans don't always cover every kind of illness. These policies come with lower premiums, but also higher deductibles and potentially more exclusions. But for those in relatively good shape, there might be better alternatives when it comes to keeping their costs down until they can qualify for Medicare, while still ensuring they have at least some protections. "If I don't want someone to walk out of the office with nothing at all because of cost, that's when I will bring up short-term plans," Kelly Rector, president of an insurance sales brokerage in O'Fallon, Missouri, told Kaiser. "The average person would like to retire at 62." 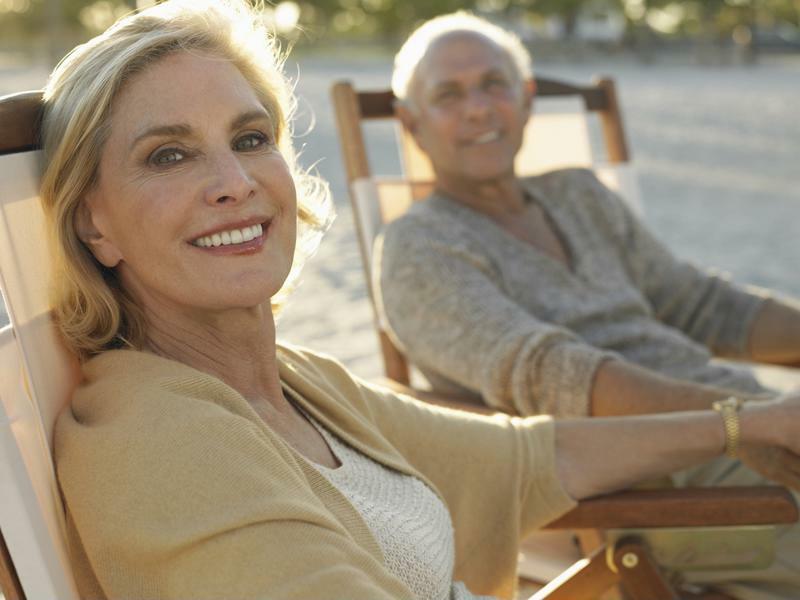 All this comes at a time when a recent poll of consumers found that the average person would like to retire at age 62, according to Mass Mutual. That's down from 64 just five years ago, and 39 percent of people say they want to pull out of the workforce full-time before they're 60. This comes despite the fact that more than a third say they're worried about outliving the retirement savings they've already put together (or will continue to), and more than a quarter also say they think they should be saving more for their golden years already but are "struggling to get by" currently. That, of course, also plays into health care costs due to the fact that every dollar spent on such expenditures is one that necessarily cannot be spent on saving for their retirement. At the same time, those who stop working before they hit 65 and become eligible for Medicare may face some of the above problems when it comes to finding affordable, subsidized health insurance on the state or federal marketplaces. While association coverage may help them avoid falling into a coverage gap altogether, older people may need to carefully consider all of their current and potential health concerns before making a hard and fast decision. Doing a bit of research and speaking with health insurers or brokers can help people make the most informed decisions about their coverage and care needs, and eventually find a long-term solution that will work well for their unique financial and health situations.